About This Mac: Provides a quick summary of your computer’s configuration, including memory, processor, and operating system release. Choose More Info for a complete rundown of everything in, on, or attached to your computer. Software Update: Gets you the latest versions of the software that came with your Mac. Your Mac will check for updates every week automatically unless you change the setting, labeled, unsurprisingly, Software Update, in the System Preferences pane. Mac OS X Software: Takes you to Apple’s Web site, where you can download neat stuff — some free, some not. System Preferences: The equivalent of Control Panel in Windows. 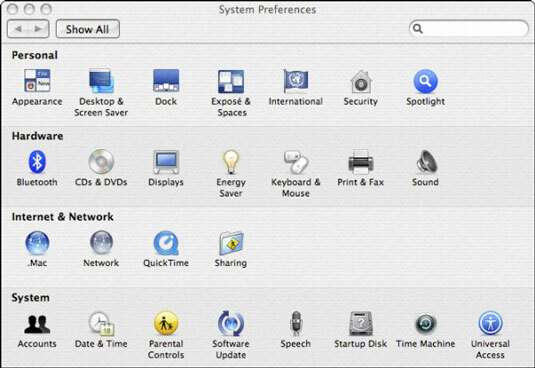 It’s where you can see and change the numerous settings associated with OS X system software. Dock: Lets you control the size, location, and behavior of the Dock. Depending on your choices, the Dock can be your best friend or be truly annoying. You may want to use the Turn Hiding On option, which moves the Dock off the screen until you steer your cursor all the way to the bottom edge, at which time the Dock pops up. Move your cursor away from the bottom of the screen, and the Dock hides itself again. Recent Items: Offers a quick way to get back to the application, document, or server that you were just using. You can tell OS X how far back the Recent Items lists should go in the Appearance pane under System Preferences. The default is ten items. 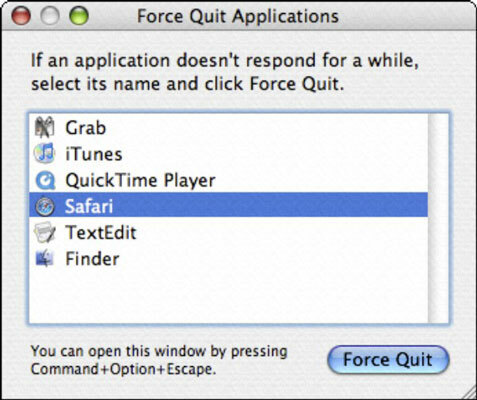 Force Quit: Lets you end any application that is not responding to commands. Commit to memory the Force Quit keyboard shortcut: Option+Command+Esc. You may need it if you can’t get to the menu for some reason. It’s the Mac equivalent of Windows’ Ctrl+Alt+Delete. Sleep, Restart, Shut Down, and Log Out: These commands perform the same tasks as they do in Windows. You control the sleep settings in the Energy Saver pane of System Preferences.